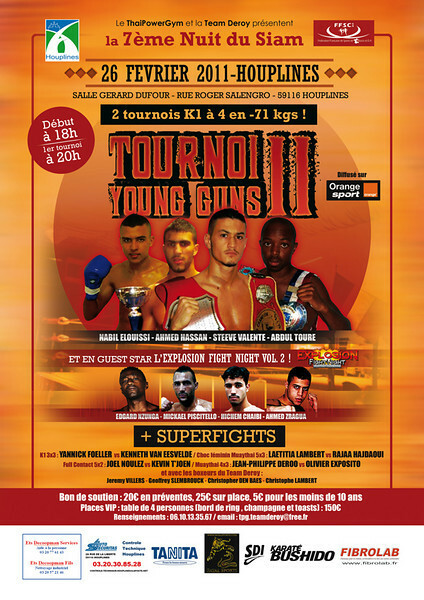 From Powergym and Lucien Deroy comes the Turnoi Young Guns 2. This will be still another event that will be highlighted by a 4-man tournament and under K-1 rules. It seems that though the Japanese kickboxing promotion is steadily on its way to a decline and eventual closure the love of the tournament under modified rules isn’t. That the format is such a long enduring and widely accepted format is telling. Fans apparently like it and internationally the format is seen more and more in use. And logically promoters seem to understand the value of getting multiple fights out of each competitor for one fee. The competitors in the 4-man tournament are among some of the more veteran names in the French Muay Thai scene so while I don’t know that the Young Guns part of the title is wholly accurate the matchups look to be very competitive and should produce some pleasing action along the way. Apparently Turnoi Young guns 2 will offer not one but 2 tournaments. The main card will start at 6:00 pm and the tournament(s) will start at 8:00 pm. Its interesting that the two brackets weren’t combined into a single 8-man tournament as all fighters are apparently going to be matched at 71 kg. The remainder of the card is mostly Muay Thai super fights which will include long time fighters of Lucien Deroy’s gym. The event is also scheduled to be broadcast in France via the Orange Sport network. ~ by fatsoking on February 10, 2011.